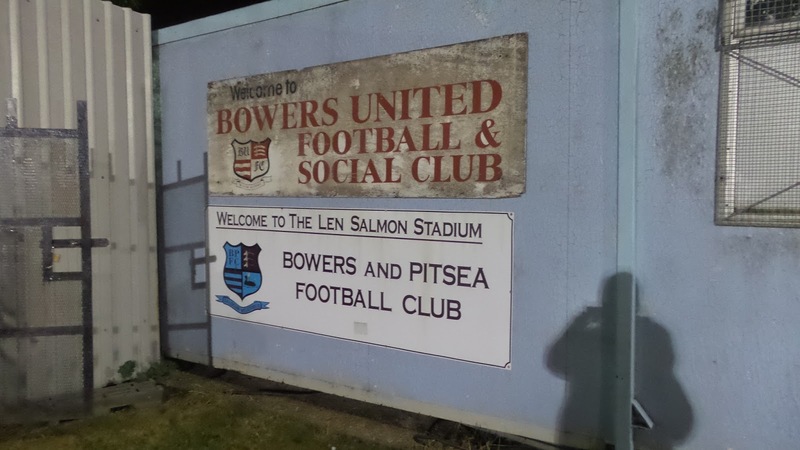 The club can trace its roots right back to 1946 when BOWERS UNITED were formed. They played in local leagues such as the Thurrock & Thameside Combination, prior to joining the Essex Olympian League in 1966 as founder members. 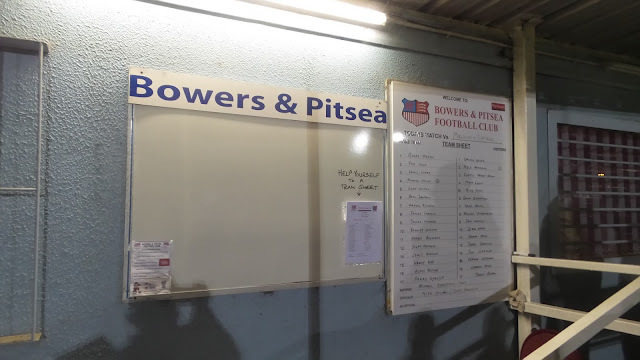 Their best season in that competition was their debut year of 1966/67 when they came 6th, but following two 8th placed finishes, they were accepted into the Essex Senior League in 1974. More often than not, they were successful, finishing in the top half in the vast majority of their seasons and even winning the league in 1981 and 1999. 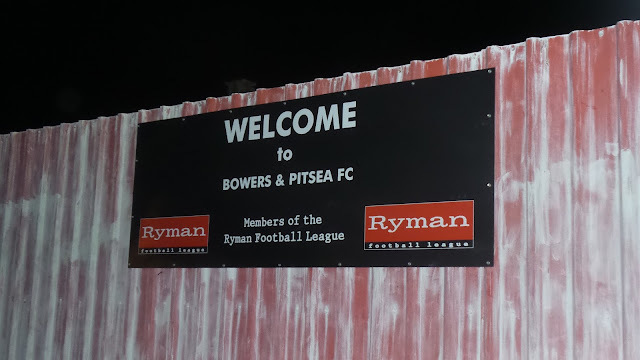 In 2004 they absorbed Pitsea FC and adopted their current name. Though league performance tailed off initially, a runners-up spot in 2014/15 gave them a good base to build on. 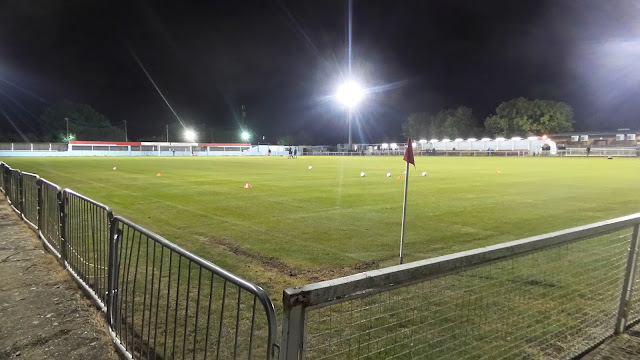 They followed that up last season by winning the Essex Senior League, after coming out on top in a close-fought battle with local rivals Basildon United. An excellent start has been made so far, with the club in a playoff position at the time of the game. The club have never had a great record in the FA Cup, having only reached the 1st Qualifying Round on 3 occasions. 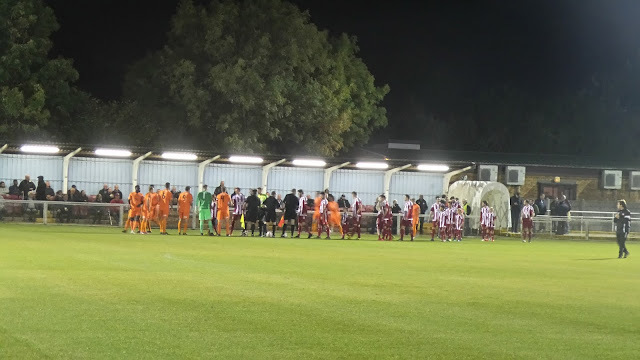 The last of those came in 2014/15 when they suffered a 4-0 home defeat to Witham Town at that stage. 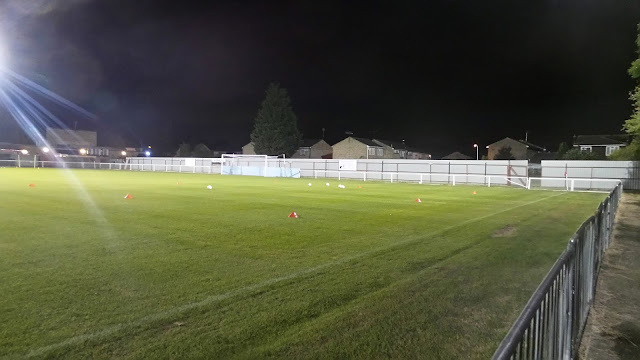 The FA Vase has proved a much happier hunting ground, none more so that last season when they reached the semi-final. 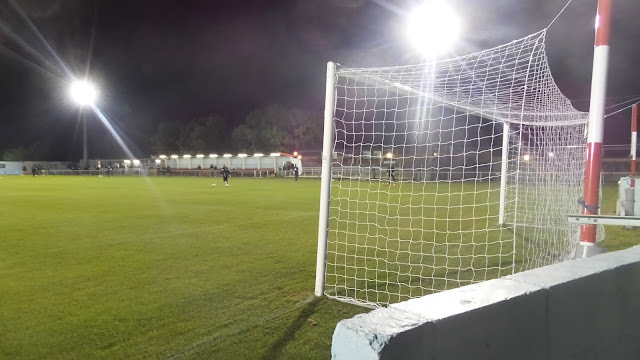 After beating Hanworth Villa, Flackwell Heath, Broxbourne Borough, Sutton Common Rovers, Ipswich Wanderers and Kidlington, they faced Vase specialists Morpeth Town in a 2-legged affair, narrowly losing 4-3 on aggregate to the eventual winners. 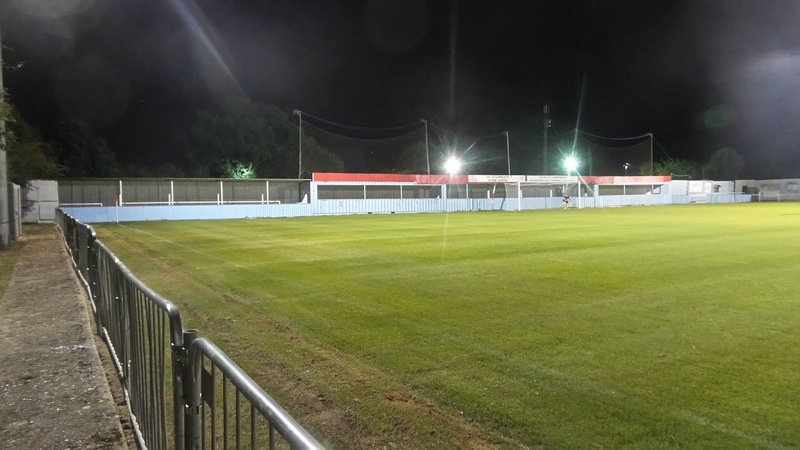 Local cup honours include the Essex Senior Challenge Cup (3 times), the Harry Fisher Trophy and the Don Douglas Memorial Trophy (4 times). 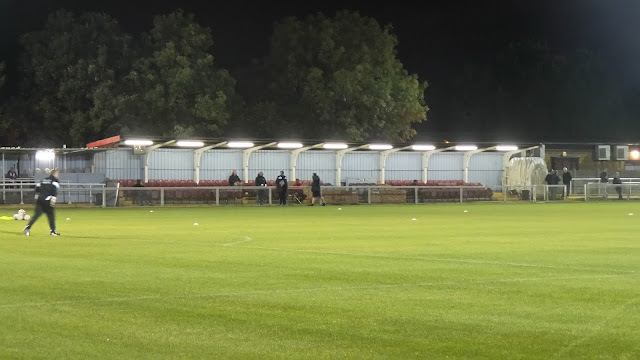 Their record attendance of 1,800 came against Billericay Town in an FA Vase game, and their record win of 14-0 came when they played Stansted in the 2006/07 season. When looking for a game for this week, I wanted to keep it local. I'd had a busy week off work, culminating in the Western League Hop. With 7 games in one weekend it was certainly a good way to get multiple games done in one day and without seperate trips, but it was very tiring. I'd only had the Monday off, and after seeing nothing stand out in the Football Traveller so I turned to my Groundhopper app on my phone. This has turned out to be very useful when I'm in a lazy mood or on a budget as it finds the nearest games on grounds that I have not visited. The only drawback is that it covers league games only, but it's helped me greatly on more than one occasion recently. 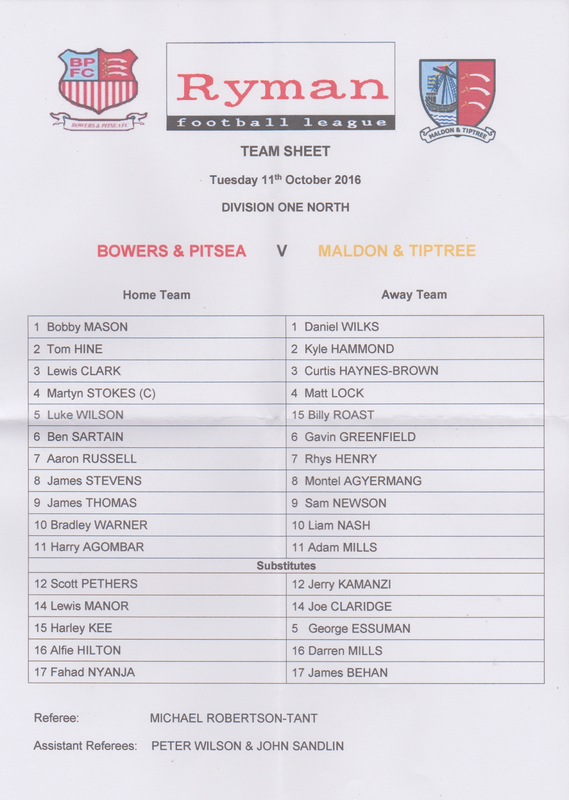 The 3 options it threw up were Coventry Copsewood, Takeley and Bowers & Pitsea. After consultation with fellow hopper Anwar, we decided on the latter, which I was happy to go along with, having been impressed with the ground when I visited for pictures some years back. It was my usual day off work on the day of the game, so I walked down town hoping to get a USB Wifi Adaptor that would solve my issues with Wifi dropping and being generally slow. My search drew a blank, as did my online research with too many negative reviews about compatibility with Windows 10. There was a host of other things to do too, including catching up with my blog from a very busy weekend on the Western Hop and indeed researching tonight's entry. I eventually left at 4PM, slightly later than usual, but still could have done with plenty more time, such was the list of stuff I needed to do. I got to Aylesbury just before 4.30 and after waiting 5 minutes for Anwar, we were on our way. We had a good journey there and so stopped in Basildon on the way, arriving around 6pm. We'd expected to find lots of choice, but in reality everywhere was closed. 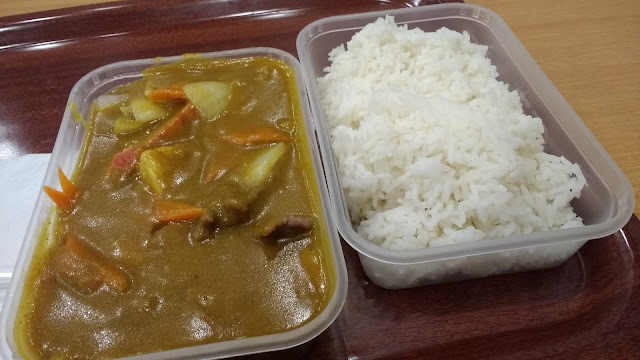 We did at least find a Chinese where I sat in and had an excellent Special Curry and rice for £5.50. We got to the ground at 7.15, with the car park already pretty full. 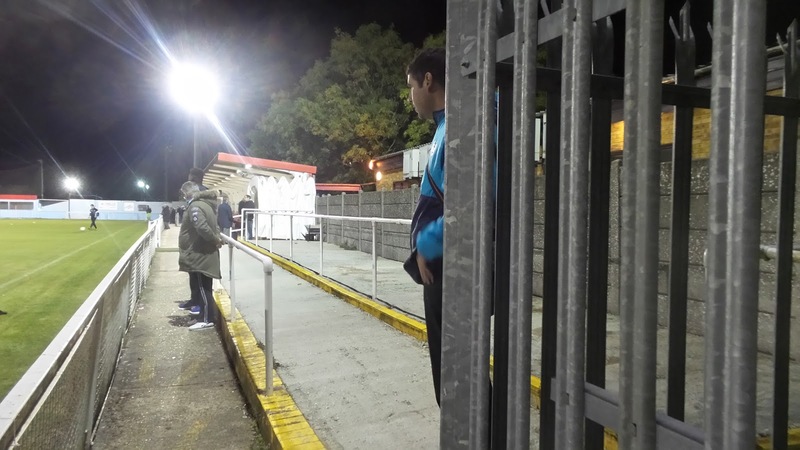 We went straight in, paying what seemed a rather steep £9 for step 4 football. 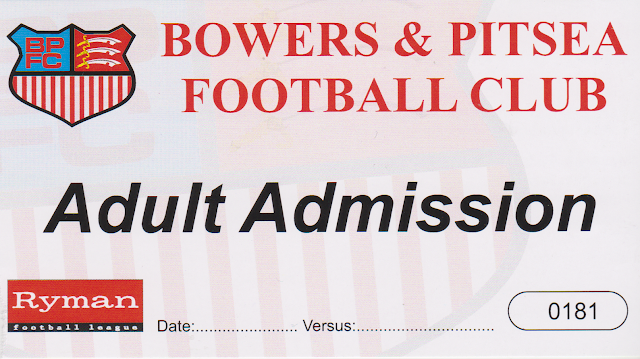 However, there were at least free team sheets and a paper ticket given. Programmes were not there yet, but I wasn't bothered as those bits of paper would suffice for me, and also not take up as much space - something that fills up quickly when you go to as many games as I do. We stood on the far side, near the dugouts and waited for the game to start. 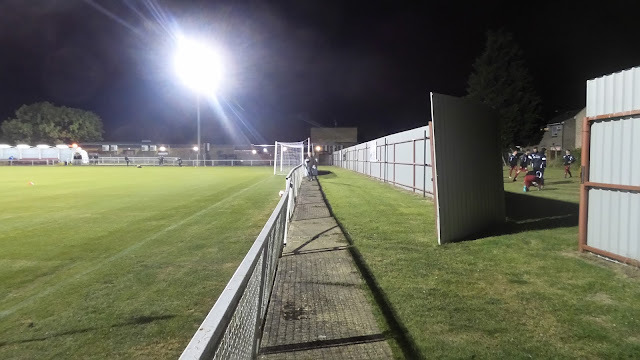 The game started at a frenetic pace on what was a small but immaculate pitch. The referee was keen to stamp his authority on the game and was very precise with his instructions. The visitors took the lead on 20 minutes, following an infringement near the edge of the area. Liam Nash stepped up and curled a great free kick into the top right-hand corner of the net to give his side the lead. They hit the post a few minutes later too, and deserved the half-time lead, despite the hosts having a legitimate claim for a penalty turned down. Though the quick pace continued, the chances dried up in the second half. Maldon & Tiptree did a very professional job and if anyone was going to grab a goal, it was going to be them. In any case, their free kick was worthy of winning any game. I learned later, from a Thamesmead supporting friend that the Isthmian League force clubs to charge a minimum of £9, so supporters of clubs like Bowers who made the step up last season, are facing quite a price increase. I'd say £7 was a fair price for this level, but when all said and done, the fuel costs made up the bulk of tonight's costs. During the game, we'd decided that we'd go to see Codicote at their new ground next Tuesday, in the absence of a good cup game coming up. I was also hoping that Anwar would join me at Westfields v Leiston on Saturday, which is one of my few unvisited grounds in the FA Cup 4th Qualifying Round. On the way home, we listened to the aftermath of the England game, which by going from what we were hearing, was pretty dire. It got us back to thinking - how many of the players that didn't get a sniff at an England cap in the late 90s, due to so much competition, would walk into the squad now and be head and shoulders above the mediocrity that currently make up the squad. At least it killed time, as we had a massive delay on the M25, due to them shutting it down to one lane. Not a workman in sight, and half an hour added to ours and numerous others journeys. Had they waited an hour, it would have been a lot quieter. As a result, time saved by staying fairly local was lost, and I didn't get home until 11.45, after dropping Anwar in Aylesbury 20 minutes earlier. The LEN SALMON STADIUM is a smart and well kept ground for the level they are at, and is situated in a residential area. There are places to eat and drink within walking distance, while the tea bar offers a reasonable range also. 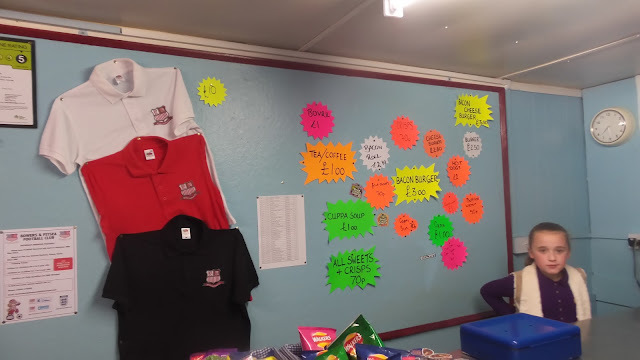 The tea bar also sells club merchandise, though the range is quite limited. There is also a bar, but I didn't go in on my visit. 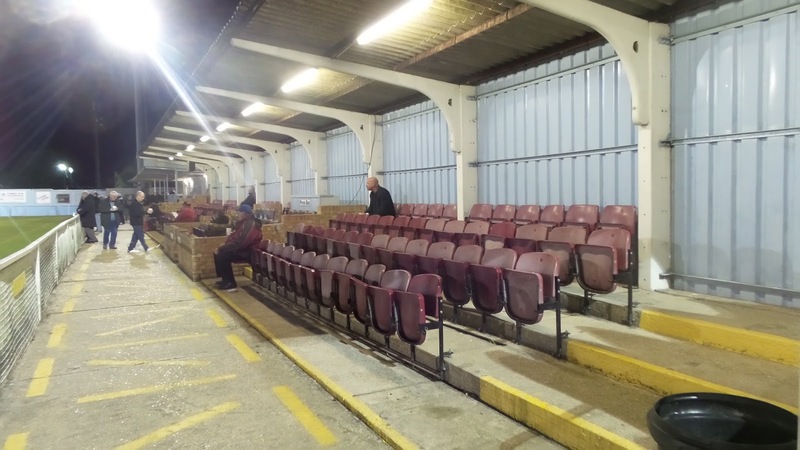 There is cover for 1000 fans, of which 200 can be seated, whilst the total capacity is 2000. I originally stopped at the ground on the way to a Wycombe game at Southend United, on 23rd January 2010, hence the daytime pictures.